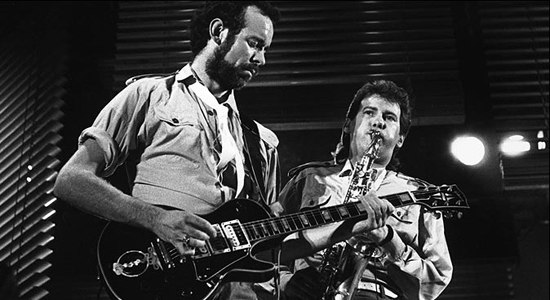 Stace: I saw the Roxy Music reunion a few (perhaps many) years ago and was surprised to find Manzanera the leader of the band. He was amazing; he looked amazing. I had bought Diamond Head, his first solo record, years before, but only because Robert Wyatt (I am a Wyatt completist) handled the lead vocals on “Frontera,” the first song. I never really got past that first track, which is shameful, but also awesome because there was that same LP casually waiting for me a few months ago, when I needed something new and thought of Manzanera. Great music leads you down the chain: Diamond Head reminded me of Nick Mason’s Fictitious Sports, another record by the non-lead-member of a much bigger band who had the juice to make a solo record and the nous to use fantastic people to help him out on vocals and songwriting, in order to make the best album possible. Robert Wyatt also sings a few on that one, much of which is arranged by Carla Bley. And the 801 Live record, with so many great players on it, reminds me of the Ayers/Cale/Nico/Eno live record, June 1 1974. Eno sings “Baby’s On Fire” on both records—it must have been his go-to-song; his “Goodnight Irene.” Mike Oldfield plays guitar on June 1 1974 (as does Ollie Halsall from Patto) and Robert Wyatt plays the drums. All roads lead to Robert!